A few weeks ago, I asked everyone on Twitter if they'd heard of Wall's ice cream because the company had decided to film here in my little town in the mountains. Since it's primarily a British company, most had not. They recently completed the commercial, which has been getting a lot more attention than I for one thought it would. It's been featured on HuffPo and Perez Hilton. It even made it to more mainstream news like this article on ABC. It's interesting to watch the Negative Nellies in the comments. Some are outraged that cops would "misuse their authority." Some are upset that public resources are being "wasted" for a PR campaign. Yes, that really is our sheriff. No, he really isn't neglecting anything. He's an administrator. And although we aren't crime-free here, this is an example of what happens around here. 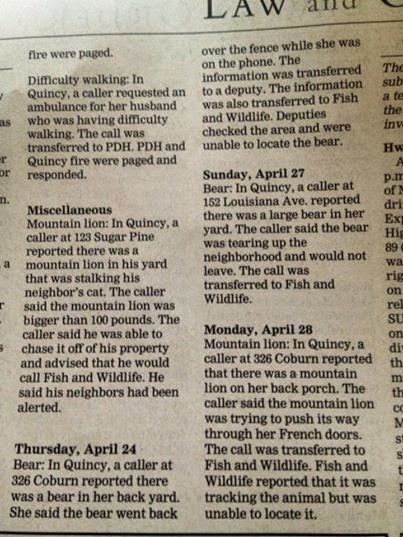 A snippet from our actual Sheriff's Blotter (all calls that come into the Sheriff's Office Dispatch Center). Although I didn't get pulled over, I'm amazed that so many were fooled by this. To be honest, our sheriff doesn't pull people over. We have SO MANY CHP in this county that nearly all traffic issues are handled through them and not our Sheriff's Dept. Parking at the front of the courthouse (where everyone is pulled over) is nearly always filled, but here it's obviously been blocked off. And if people were paying attention, they knew through social media that a commercial was being filmed here. But what about those who were made late by this stunt? Well, everyone is late here in town. It's almost a cultural thing (that really drives my punctual self batty). But rest assured, no one has to deal with traffic issues: there are a grand total of 2 stoplights and 5500 people in the town. People here thought it was hilarious. Not only do we nearly all know Sheriff Hagwood, but most of us know at least one person in that commercial. We love our town. We love that we have no traffic and very little crime. Sheriff Hagwood did not receive compensation for this, but Wall's did donate to our local animal shelter and our arts council in his name. I'm calling that a win.